Calling all teachers, students, activists and anyone who cares about the public education of the children of America. 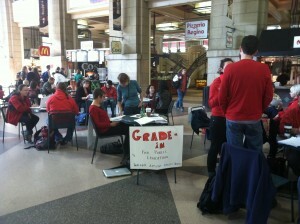 TAG Boston will be holding a Flash Mob Grade-In at the food court in South Station on Sunday, October 16th from 11am-1pm. The focus is to show the public how dedicated we are to our students and our profession as well as build alliances with teachers from all over Massachusetts. Wear RED to show your support and solidarity. Show up anytime between 11am and 12:45pm at the South Station food court for an opportunity to grade, do homework, plan lessons and collaborate with teachers and students. At 12:45pm we will begin to convene in preparation for an optional march from South Station to Dewey Sq. to support the Occupy Boston Movement.